Heil all! I'm Sveinn Fjǫlnirsson, the one who set up this forum. 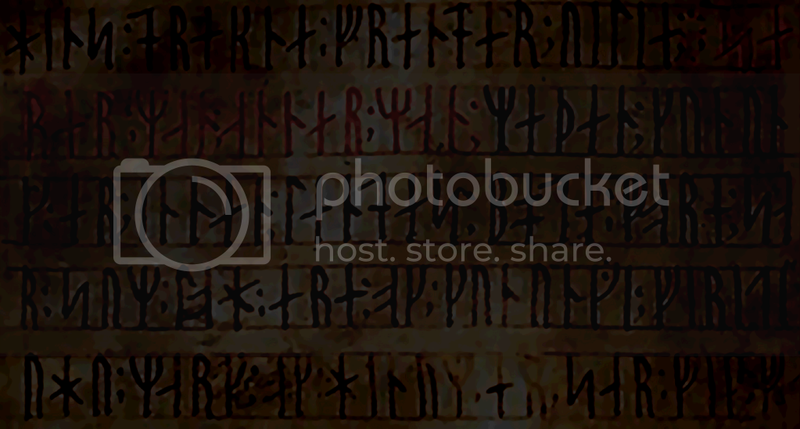 It has long been my dream to bring back Old Norse to the 21st century. A difficult task perhaps? I'd say challenging at least, but if the Vatican City still claims Latin for an official language, then why should there not be a language for a community of viking enthusiasts, viking age re-enactors, norse polytheists, followers of the old way, Icelanders, Norwegians, Danes, Swedes, Faroe Islanders, and other folk with a keen interest in history? Hey there. I'm a Faroese person. Not really a language revival enthusiast, but am happy to help anyway that I can. Heil, I'm Jesse uhm soon to be twenty years old. The name Jostein was given to me by a really good friend, you know who you are. I life in the Netherland not the best country but it’s ok. I like history, nostalgia, music, obscure things. And I’m really interested in the old Viking culture. I currently have two music projects, first one is black metal band with a other guy, and second is a one man project with a lot of styles. I joined this forum to learn this long died language and try helping to bring it back. And I’m already excusing for my all of spelling mistakes, I am a dyslectic guy. I'm doing my best not to make any mistakes. Trouwens... Nederland IS het beste land in de wereld! Háhá! My name is Harmen and I'm a good friend of Jesse. He is also the one that introduced me to this forum. I'm very intrested in the Viking culture and the Old Norse mythology. Although I don't speak any nordic languages yet, I'm willing to learn them. Well this is the mother of all Nordic languages... so if you learn this, you will be able to learn Norwegian, Icelandic, Faroese, Danish and Swedish quite easily. I am James, using my slightly tongue-in-cheek Faroese name! I learn Faroese (with many many thanks to Johan Petur for the help! ), so I can do an ok job at reading old Norse and Icelandic. My name is Bruni and I'm very very much with you when it comes down to reviving the Old Norse language. Its sounds so beautiful and ive tried to learn it by myself for a while without alot of success. For my work I am a Viking interpreter and it would really be wonderful to actually speak old norse to the public and eventually teach other Vikings it so that we could have a Viking conversation, imagine . . wouldnt that be brilliant round an open fire in the Winter!! I am really eager to learn and will lend my support 110%. That's put some real fire in this project! Thank you! Hej I am Kvífa Úlfheiðr Djármadagr, real name Laura (The Norseised name is from a Chosen Middle name Caoimhe). I am studying a degree in Modern foreign languages, but my interests include ancient languages. I am of Irish decent from an area where the norse men visited. I am quite enthusiastic about the project but i often am busy with other commitments, I will put in as much as I can. It's been years since my Old Norse class at UW-Madison. but I'm still interested in Scandinavian linguistics and language history...especially from Sweden's perspective. (Iceland wasn't the only place where Norsemen lived and talked, despite the impression some courses give you... ) I'll probably spend most of my time in the East Norse and mythology groups, though I'm glad to help anyone else who needs it. Take care! Like I've said in the past, other projects such as a reconstruction of Old East Norse would have been great, but as you may know... there just aren't enough sources to achieve this. Nice to have another person on board our longboat of language! My name is Victoria - short: Tora, I live in Norway and am passionately in love with my language. I'm trying to learn ON at the time, and hopefully I'll be able to contribute in the forum eventually. I'll probably have loads of questions, so bear with me! It is great to see that there are still some people who are interested in my project. prefer the name Tora in the first place? It's really great to have you in our project! And to help with your greeting, if "frændi" is 'friend', then 'friends' is "frændr"
Mostly, we've been using the word "vinr" for friend, with "vinir" as 'friends'. But frændi is a great word! More like "kinsman" perhaps than "friend". Maybe now I will use frændi more often. Great, Þakka! I realised after I'd posted that my "frændarnir" probably would mean something like "Hi the friends!" With the article, am I right? Haha. Anyway, vinir sounds better to me also, as it is closer to our norwegian "venn" / "venner"
Oh, and I do indeed prefer Tora (instead of Vicki) because it has more of a norse "schwung" to it. The english part of my family calls me "Tor" which absolutely does not go in Norway as it is a common boy's name. So Tora it is. I grew up with the stories of the norse gods, and up until I was quite big actually believed it was Thor with his Mjølner who made the thunderstorms. So maybe when I get my Þ-key I'll start using Þóra instead. So again, thanks for the help, and I'm really glad to see someone is actually trying to make this beautiful language come back to life! Like "Frændrnir minn" which in English would be "My the friends" which doesn't work... we'd say "My friends" normally obviously. Anyways, it's probably easier just to say "Heil, vinir!" or "Heil, frændr!" Well, you'll fit in just perfectly here... a lot of us still DO believe that Þórr makes the thunderstorms. Some of us, like me, are Ásatrúar, you see. Ek heit Ásleikr, ok ek em einn norðmann frá Ásleikbekk. Læra at tala á norrœnu vilja ek gjarna, ok því em ek komminn har um þan þing. Auðvitat vil ek reyna at skrifa at eins á norrœnu, þótt skal þat vera erfitt... Ek meina, þarf ek at [æfa] sik lítt. I also know that in Faroese, referring to someone as "vinurin" is completely acceptable and the closest English equivalent is "my friend". So that reads entirely normally for me in ON as well. Greetings to our two new members! Ásleikr, you appear to speak ON very well already! But maybe I can give you a few hints to help you. Norðmann is accusative... the verb "vera" takes a complement instead of an accusative noun... which means you only need to use the nominative which is "Norðmaðr". The word "einn" doesn't usually mean "a" or "an" (the indefinite article) like it would in German "ein" or Dutch "een" etc. it is mostly used just as "one"... so to say "I am one Norwegian" sounds a bit strange... because you think "Well, he's not going to be two Norwegians." XD So it's best to say "Ek em norðmaðr". I know Ásleikbekk is a place name... but depending on what noun "bekk" is... determines what form it should take in the Dative case which "frá" requires.... it could be Ásleikbekk as you wrote... but I guess it would be Ásleikbekki. Good idea with using modern Icelandic words for Norse words you can't find. I do that all the time... I can't find a cognate for "æfa" but I think "drýgja" can be used for "practise"... And you don't always need to have the particle "at" before an infinitive in written Norse, so you could put "Þark ek drýgja sik lítt"
Áhuga you can probably get away with... Hljóðkerfisfrœði might work in Icelandic... as sound-system-study but in Old Norse it means "sound-bundle-study XD... so maybe for phonology you could say language-sound-study? Málhljóðsfrœði? That's all I can think of... I have also recently decided that "Þakka ek" or just "Þakka" might be more traditionally Old Norse than "Þakka fyrir" which is perhaps more modern. This is just speculation though. Hope that helped! Ok í bók "An Introduction to Old Norse" er þat svá skrifatt. Ek hygg "frá Ásleikbekk" er júr réttlig mynd... Frá PG *bankiz.